If you are offering a course that will be publicized through a catalog or brochure, you or the course sponsor will need to write a course description. The course description is vital to getting people to enroll in your course. A good course description can mean many enrollments while a poor course description can doom your course before it starts. Ideally, you should work with your class sponsor in writing the course description. Find out if you can or should submit a course description, and then follow these guidelines. Many if not most course descriptions are repetitive, dull or grammatically sloppy. If people do not read your course description, they will not take your course. Look at a typical course catalog. See how many of the descriptions start out, “This class will…” or “The instructor will...” or “An introduction to...” These openers are uninformative and boring when used over and over again. Following a few simple rules, you can write a course description that is simple, interesting, clear and readable. Here are some poor course description sentences. The title. The title should be simple or catchy. Long or complex titles tend to confuse, and dull titles will not capture the reader’s eye. Generally, for skill classes such as home repair or the arts you will want a simple title. For idea classes such as interpersonal relations and social issues catchy titles will attract the reader, turning an average or dull topic into an interesting one. Here are some good course titles. Logistics. Logistics include the teacher’s name, class location, day, length, cost, material fees, course number and other adjunct information. The course sponsor normally provides this information, although you should be aware of all information pertinent to your class. The description should run from 30 words to 120 words in length. Fewer than 30 is too sketchy. Too few words make the course look insubstantial and may not allow for enough information to be included. If a description is, more than 120 words, it is too long. Large blocks of copy can be intimidating, and people will rarely read the whole description if it is too long. This wastes space and may lose enrollments, too. The description should be divided into two paragraphs if it is over 60 words. More than 60 words in one paragraph is too hard to read. The teacher biography or qualifications should not be mixed in with the course description. This information can be brief, and should appear at the end of the course description. Do not use abbreviations unless EVERYONE knows what they stand for. Write in complete sentences. Incomplete sentences should be used infrequently and only for emphasis. Your description should focus upon the content of the course or the learner, not upon the course itself or you as the teacher. To attract learners, the description should emphasize the benefits to the learner coming from either the results of attending the course or from the value of the subject matter itself. Learners are interested in themselves and in the content of the course, not in the course itself or the teacher, although highlighting the qualifications of a skilled instructor can help sell your course. Unique or excellent qualifications are seen as a benefit. In general, the first one or two sentences should be enticing, dramatic or otherwise interesting. The following two to five sentences should be a summary of the scope and content of the course. 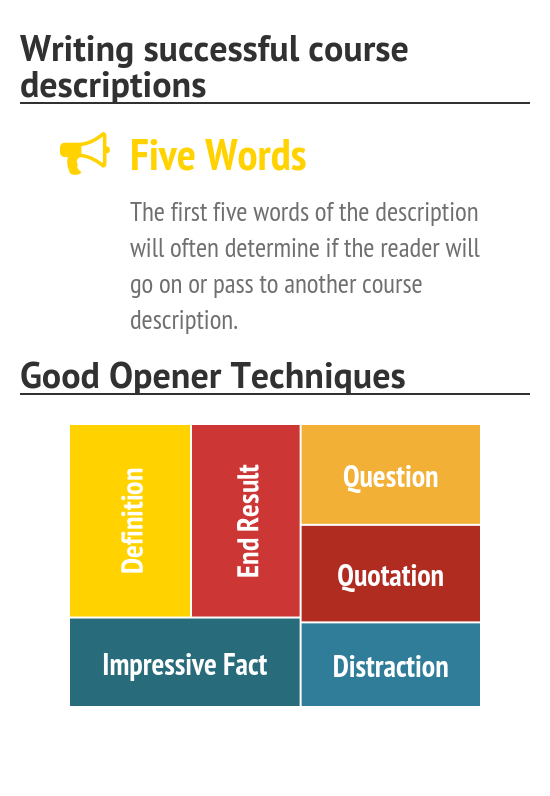 The first five words of the description will often determine if the reader will go on or pass to another course description. Definitions, end results, and impressive facts are used frequently in course descriptions. Questions, quotations or distractions are used sparingly. Following your opener you can talk about what will be covered in the course and other content matter. While you should avoid the following sentence first words in the first two sentences of the opener, they are appropriate for the rest of the description IF they are not repeated in the same description. The teacher biography. The teacher biography should be 15 to 50 words in a separate paragraph underneath the course description. Some organizations run all of their teacher biographies at the end of the catalog. The biography should have two seemingly contradictory goals —1) to establish you as qualified; 2) to project your image as a peer, not too far above the potential learners. Learners want to know you are qualified, but they also want someone who can relate to them. Your qualifications should be stated in terms of experience. Use credentials or degrees only as a last resort. By including your interest or motivation in teaching the course, the participants will also see you as a likable peer. Here are examples of good course descriptions. Batik is an age old art of fabric coloring using wax and dye. This workshop is open to beginning and advanced students. It covers preparation of cloth and dyes, some design principles and sources, effects of different wax techniques and mixtures, color theories related to the craft, and the various finishing methods. Individual attention will be emphasized. Students can expect to complete four to six works. The battlefield is the minds of American voters—and the ultimate weapon is television. With each election video politics has become more and more a prevailing force in American government. Gary Yordan will present some examples of political advertising and the strategy and methods used in developing the ads. Why are there mountains, anyway? Why did the old earth go to all the trouble? Why doesn’t the whole planet look like Nebraska? We will examine the revelations of plate tectonics and explore the old and new theories of mountain formation. We will also take a Kodachrome journey to the Himalayas. Depending on class wishes, a field trip may be scheduled. The “biological clock” ticks away, causing a sense of urgency in many women to decide or re-examine their decision to bear a child, “before it is too late.” This class sheds light on what remains of a hazy, mystical area to many women. There is no right or wrong in this class. Come explore your own solutions in a warm, supportive group of women. This post was written by Julie Coates, LERN Senior Vice President for Information Services.